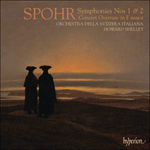 By the time Spohr came to write his Grand Concert Overture in F major in the summer of 1819 his career had passed through some important stages. He was orchestral leader at Vienna’s Theater an der Wien from 1813 to 1815, he made an artistic tour of Italy in 1816–17, and later in 1817 he accepted the post of opera conductor in Frankfurt. But Spohr’s high artistic aims clashed with the down-market and penny-pinching policy of the theatre’s chief director and he resigned in September 1819 with the knowledge that he had under his belt a lucrative contract with London’s Philharmonic Society for the following season. On 29 November 1819, shortly after his resignation, Spohr’s concert overture was played at the Leipzig Gewandhaus and then it was packed ready for the trip to London where part of his contract with the Philharmonic Society was that he should present them with a new, unpublished orchestral work. The overture was played through in London on 3 April 1820 at the Society’s trial night, at which possible works for future programmes were evaluated. However, there was no available spot for it in the 1820 season so its London premiere was delayed until 21 March 1821. Today Spohr’s still-unpublished autograph score is in the British Library’s Philharmonic Society archive. The overture’s Adagio molto introduction in the tonic minor includes the germ which provides the main motif of the Allegro vivace. The work is notable for the recapitulation starting with the second subject, something not uncommon in Spohr’s violin concertos but rarer in his symphonic pieces, and it inhabits the same soundworld as the forthcoming second symphony, a work inspired by and written for the Philharmonic Society orchestra. Lorsqu’il en vint à écrire son Ouverture de concert en fa majeur, à l’été de 1819, Spohr avait déjà franchi d’importantes étapes professionnelles. Il avait dirigé l’orchestre du Theater an der Wien de Vienne (1813–15) et effectué une tournée en Italie (1816–17) avant d’accepter, en 1817, le poste de chef d’orchestre de l’opéra de Francfort. Mais ses hautes ambitions artistiques se heurtèrent à la politique bas de gamme et pingre du directeur général du théâtre et il démissionna en septembre 1819—il se savait déjà détenteur d’un lucratif contrat avec la Philharmonic Society de Londres pour la saison suivante. Le 29 novembre 1819, peu après sa démission, son ouverture de concert fut jouée au Gewandhaus de Leipzig avant de partir directement pour Londres, où il devait présenter une œuvre orchestrale inédite s’il voulait respecter son contrat avec la Philharmonic Society. Cette exécution londonienne eut lieu le 3 avril 1820 lors de la soirée-test visant à évaluer les pièces des futurs programmes de la Society. Mais, faute de place pendant la saison de 1820, la création londonienne de l’ouverture fut repoussée au 21 mars 1821. Aujourd’hui, la partition autographe de Spohr, toujours inédite, est conservée dans les archives de la Philharmonic Society, à la British Library. L’introduction Adagio molto de l’ouverture, au mineur de la tonique, porte en germe le motif principal de l’Allegro vivace. L’œuvre vaut par sa réexposition qui s’ouvre sur le deuxième sujet, une chose courante dans les concertos pour violon de Spohr mais plus rare dans ses morceaux symphoniques; son univers sonore est celui de la Symphonie no 2 à venir, écrite pour l’orchestre de la Philharmonic Society qui l’inspira. Als Spohr im Sommer 1819 seine Grosse Konzertouvertüre in F-Dur schrieb, hatte er in seiner Laufbahn bereits einige wichtige Stationen hinter sich. 1813–15 war er Konzertmeister am Wiener Theater an der Wien, unternahm 1816–17 eine Künstlerreise durch Italien und akzeptierte 1817 die Stelle als Operndirigent in Frankfurt. Aber Spohrs hohe künstlerische Ansprüche kollidierte mit der auf die Masse orientierten und knauserigen Praxis des Theaterintendanten, und er kündigte im September 1819, als er sich bereits für die nächste Saison einen lukrativen Vertrag mit der London Philharmonic Society gesichert hatte. Am 29. November 1819, kurz nach seiner Rücktritt, wurde Spohrs Konzertouvertüre im Leipziger Gewandhaus gespielt und dann für seine Londonreise eingepackt, wo eine Bedingung in seinem Vertrag der Philharmonic Society ein neues, unveröffentlichtes Orchesterwerk für sie forderte. Die Ouvertüre wurde am 3. April 1820 in London in einem Probeabend der Society durchgespielt, in dem Werke für eventuelle Aufnahme in zukünftigen Programmen ausprobiert wurden. In der 1820er Saison gab es jedoch keinen Platz für sie, und die Londoner Premiere verzögerte sich bis zum 21. März 1821. Spohrs unveröffentlichtes Autograph findet sich bis heute im Archiv der Philharmonic Society in der British Library. Die Adagio molto-Einleitung der Ouvertüre in der Molltonika enthält den Keim für das Hauptmotiv des Allegro vivace. Das Werk ist dafür bemerkenswert, dass die Reprise mit dem zweiten Thema beginnt, was in Spohrs Violinkonzerten zwar nicht ungewöhnlich ist, aber in seinen symphonischen Stücken seltener vorkommt, und es ist in der gleichen Klangwelt angesiedelt wie die bevorstehende zweite Symphonie, ein Werk, das vom Orchester der Philharmonic Society inspiriert wurde und ihm gewidmet ist.